Slowing the deterioration of steel infrastructure with safer, corrosion-resistant coatings is the goal of the Exploratory Advanced Research (EAR) Program project "Green Advanced Coatings for Application on Steel Structures and Bridges." The project will also develop a model to assist bridge owners in setting optimal rehabilitation schedules for steel bridges. City College of New York is conducting this research, which was funded by the Federal Highway Administration (FHWA) in 2009. 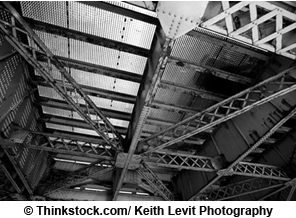 Corrosion of steel bridges reduces bridge service life and compromises public safety. Caused by exposure to moisture and atmospheric pollutants, particularly chlorides and sulfates, corrosion costs the Nation an estimated $500 million annually based on year 2002 index of cost for maintenance and rehabilitation. Consequently, the development of more effective steel coatings has been a high-priority research area for many years. A polyaniline (PANI) epoxy system with added carbon black. A polymer with high electrical conductivity, PANI was used to reduce the need for added zinc and improve scratch resistance. A nanomaterial-enhanced calcium sulfonate alkyd (CSA) system. Nanoclay, which is less costly than other nanomaterials, was used to improve corrosion resistance and scratch resistance. The researchers expect to learn much about the behavior of nanomaterials within alkyd and epoxy coatings during this process. "The continuing challenge in using nanomaterials in this way,"says FHWA's Paul Virmani," is to disperse the additives evenly throughout the mixture and stabilize the uniform distribution. Nanoparticles tend to agglomerate into larger formations, disrupting availability of the advantageous properties they contribute." Carbon black also tends to clump when mixed in liquids, and rapid gelling of some PANI additives could complicate large-scale, spray application of a coating. In phase I, the investigators compared the properties of the two experimental coatings, at different concentrations of additives, with those of an organic zinc–rich epoxy-based primer. (All coating systems in the project receive polysiloxane topcoats.) The PANI-epoxy system performed well in short-term electrochemical impedance spectroscopy tests. The nanoclay-enhanced CSA system was superior in adhesion strength, drying time, and scratch resistance, but corrosion resistance seemed compromised by uneven dispersal of nanoparticles. In phase II, now underway, the project will explore two alternative additives for the CSA-based system and conduct accelerated testing and weathering studies of the CSA- and epoxy-based coatings. Accelerated corrosion tests will be equivalent to 20 years of field exposure that includes some elevated temperatures, salt exposure, humidity, and sulfur-dioxide exposure cycles. In the outdoor weathering study, with and without salt, periodic testing at five intervals will be used to characterize performance over 18 months. For the CSA-nanoadditive system, researchers will first concentrate on improving and quantifying the dispersal of nanoclay and re-testing the system's properties. They will also conduct these activities using nanosilica and nanoalumina as alternative additives, and the most promising of the three CSA-nanoadditive coatings will be subjected to the accelerated environmental testing and outdoor weathering study. Finally, the epoxy-PANI coating and the best-performing CSA-nanoadditive coating will be tested further in a 16-month, large-panel outdoor study. Throughout the project’s tests, performance will be compared to standard zinc-rich and zinc-free control coatings. The comprehensive testing program for this project will determine the realistic expected life of the coating system for steel bridges located in adverse environments in the field. Detailed data on various performance parameters from the research during the investigation will be used to estimate lifetime deterioration of structural components. 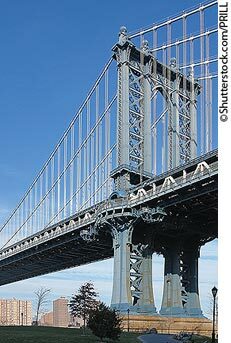 "Success in this project will advance research and practice in steel coatings in several ways," Virmani concludes, "first by providing new insights into the process of incorporating nanomaterials in alkyd and epoxy coatings; second, by presenting new formulations with potential for further development; and finally, by advancing life-cycle management of steel bridges through improved understanding of steel corrosion processes." Although this project is focused on protection of steel bridges, a new corrosion-inhibiting and environmentally friendly steel coating would have many other potential applications for other steel structures. For more information on this project, contact Paul Virmani, FHWA Office of Infrastructure Research and Development, at 202-493-3052 (email: paul.virmani@dot.gov). FHWA's Exploratory Advanced Research (EAR) Program focuses on long-term, high-risk research with a high payoff potential. The program addresses underlying gaps faced by applied highway research programs' anticipates emerging issues with national implications, and reflects broad transportation industry goals and objectives.